Today's therapy dog handlers recognize the need to be teammates with their dogs, not just supervisors. Teaming with one's dog involves unobtrusively providing physical and emotional support as well as respectful guidance in what to do. Being a teammate requires attention to the handler's behavior, not just the dog's. 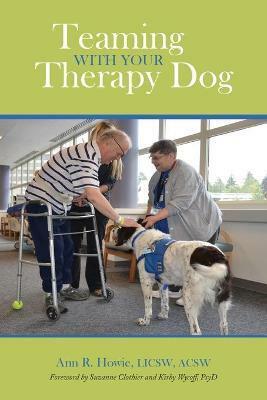 This book reminds all handlers that being conscious of what they do with their dogs increases the effectiveness of therapy visits as well as providing a more rewarding experience for all involved.Written by a nationally famous practitioner with decades of real-world experience, the book introduces the "STEPs of Teamwork" and how those STEPs fit with a Therapy Dog's Bill of Rights. These general principles free handlers to apply them in their own way to their therapy dog's individual personality and work. As the author writes, "The book explores a way of being conscious of what you do with and to your therapy dog to support him in his work. It describes functional principles of behavior you can learn and use immediately, either together as a package or independently." Using an exciting new methodology, the author guides readers to deepen their relationship with their dogs by acting consciously and respectfully. Ann R. Howie began integrating animals into her counseling practice in 1987. She has both state and national credentials as a clinical social worker (counselor). Combining her master's degree with a national certificate in canine learning and training, Howie is uniquely qualified to work with both people and animals, specializing in animal-assisted therapy and therapy dog training. She was part of the initial task force that developed Standards of Practice for Animal-Assisted Activities and Therapy. She founded and coordinated a hospital animal-assisted activities and therapy program from 1990?1997, and she was Pet Partners' (formerly Delta Society) national director of animal-assisted therapy services from 1995?2000. She is an adjunct faculty member in the Graduate School of Social Work at the University of Denver (Colorado) and also has been an adjunct professor in the Master's in Counseling Psychology program at St. Martin's University in Olympia, Washington, USA.